"Can you tell me where I would find my Evernote email address? I noticed others (in our organization) have been adding their Evernote email address to the CC line on emails so that it gets filed in Evernote and I would like to do the same." Each Evernote account has its own unique email address which can be used to automatically create notes from any email that you send to that unique email address. This can be very handy when you want to retain email correspondence alongside other project notes. Notice that on the Mac, Evernote makes it easy for you to add that email address directly to your address book in one click with the button right below your unique email. If you have already added it to your address book, you can click the button to view the email. That is it! Now, when you compose an email, you can add the unique email address for your Evernote account to the CC or BCC line and it will auto create a note that documents your communication. The Evernote note created from my response based on including my Evernote email in the BCC field. Want further details on how you might benefit from this feature of Evernote? 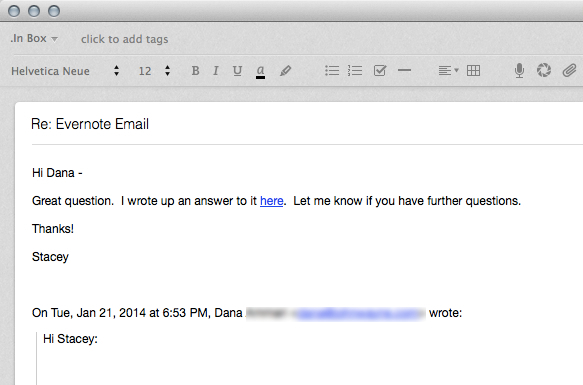 Check out the Evernote blog post Emailing Into Evernote.